Decide what seeds you are interested in planting. Don’t just think about flowers; many vegetables and greens can be grown easily- and planted early- to fill your salad bowl and frying pan in the coming months. Check out West Coast Seeds and Salt Spring Seeds for high quality, organic, heritage and heirloom seeds. Save money and grow your own ‘starts’ indoors. February is the month to begin onions, peppers, tomatoes, leeks and shallots. Create garden boxes to add food to your planting plan. The advantage of garden boxes is that they can aid in the drainage of wet soil, can save your back and soil quality can be more easily managed. Vancouver rain getting you down? Are you looking for a punch of colour as you walk up your sidewalk? Fill a planter with Primroses or Pansies for that inspiring welcome. Chance an early sowing of peas, radish or broad beans in late February. If the moisture level is good you will get early germination, and an earlier feast of your first seasonal vegetables. Save some of the seeds in the package for a second planting in May. Sweet Peas are a favourite of mine. 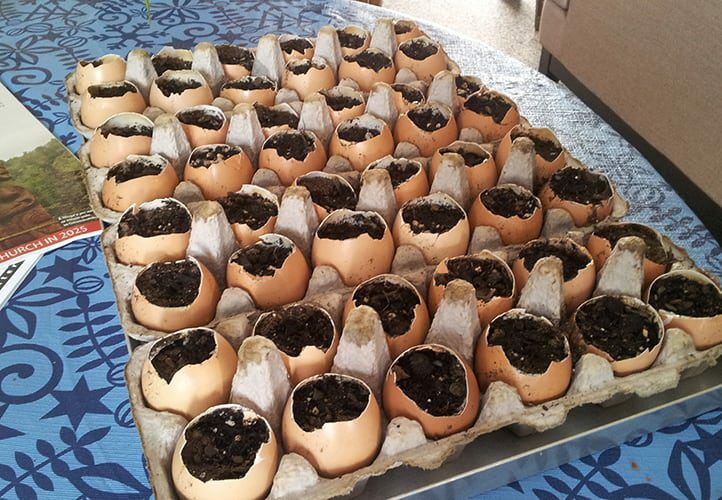 They can be started in small pots (or egg shells) filled with manure from your local garden store, and will be ready to be planted outside in early March. If you haven’t already, be sure to purchase a gardening journal to keep track of planting dates, frost dates and ideas for your lawn care needs and designs. February is the perfect month to gather your dreams for an enjoyable summer in the garden. Now is the time to add hardy ornamental trees or fruit trees to your landscape. It is best to plant them while they are dormant. A showy Chinese Snowball can add real interest to your garden. Take a look at your soil. All soil, like all humans, needs three things; air, water and food. Determine if you need to increase the air in your lawn(aeration), or if you need to increase the food content (top dressing), and water- well we have an abundance of that, but it has a tendency to wash away nutrients creating a more acidic environment. If this is the case, perhaps you’ll need to add lime? Again, I recommend Bur-Han’s Lawn Care Packages for these services. ** I recommend Bur-Han Garden & Lawn Care’s “One-Time Garden Clean-Up” for you. Rod lived and worked in Vancouver, BC for 4 years and now runs his own urban farming business in Calgary, Alberta. Leaf & Lyre Urban Farms uses the SPIN Farming (Small Plot Intensive) model to maximize land use for food production in the urban setting. Rod lived and worked Vancouver, BC for 4 years. Currently, he runs his own urban farming business "Leaf & Lyre Urban Farms" that uses the SPIN Farming (Small Plot Intensive) model to maximize land use for food production in the urban setting. He knows farming, gardening, and landscaping.